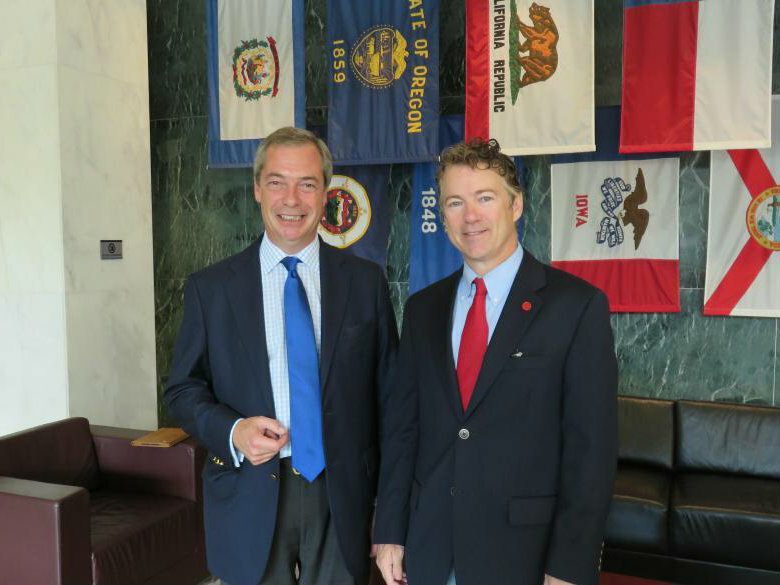 UKIP leader Nigel Farage met with prominent American Senator Rand Paul in Washington DC this morning. The two men are understood to have discussed global affairs during the early-morning meeting, as world leaders meet at the Nato summit in Wales and the threat of ISIS grows in the Middle East. Senator Paul is regarded as an arch-libertarian law maker and a credible candidate for the Republican nomination for President of the United States. Athough his father, Ron Paul, remains staunchly non-interventionist on the world stage, Rand has conceded the America to intervene in some cases. UKIP have shown themselves to be one of the most non-interventionist parties in Britain. They opposed British action in Libya, and have been critical of of the 2003 Iraq war. Mr Farage’s meeting will be warmly welcomed by many in UKIP, which has a strong libertarian wing. Douglas Carswell, the Conservative MP who defected to the party last week, is also regarded as a prominent libertarian personality, making regular calls for electoral reform, including the right to recall MPs.